In SKINNYGIRL SOLUTIONS, Bethenny offers hard-won advice on how to maintain a wellbalanced life. 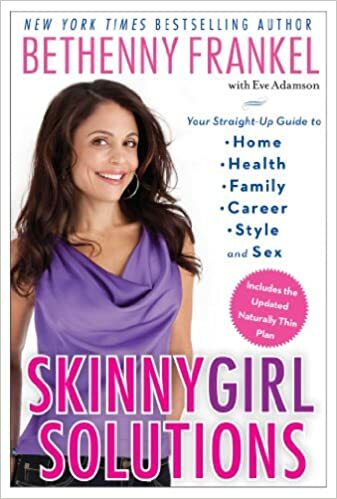 In Skinnygirl Wellness, Bethenny updates her advice on how to be Naturally Thin with an all new Quick-Start Plan and tips for getting kids (and the whole family) to eat better without complaints! The Skinnygirl Solutions for Daily Life section reveals Bethenny’s keys to managing a hectic schedule, keeping a beautiful home, and finding time for love, family, and yourself. Lastly, in Skinnygirl on the Job, Bethenny addresses such issues as launching a career that fits with all the other important components of your life, knowing if you’re ready to have your own business, the pros and cons of working from home, the 101 on finance, and what to do when things go wrong. In SKINNYGIRL SOLUTIONS Bethenny gives her always honest take on how to make smart, everyday choices that will lead to a fabulous Skinnygirl life.